It was the 26th of April, 2004 and the journalists had cornered Adriano Galliani, who was nothing short of emphatic, “Ancelotti is the coach of the current European champions and in the same year won the Italian Cup and European Super Cup. I don’t need to add anything else”. Milan of course had crumbled in Europe barely 15 days back to Deportivo La Coruna, after the team had surrendered a 4-1 lead from San Siro in the 1st leg. The questions on Ancelotti were piling up since he was at the helm of a Juventus side which surrendered the Scudetto on the final day to Lazio despite having a 2 point lead going into the final day. With that in background, it was quite pertinent to wonder if Carletto could hold off the charge of Roma, under the guidance of Fabio Capello. Going into that showdown with Roma on May 2nd, 2004, Milan had to contend with a lot of issues. Roma had been outstanding in the first half, matching Milan and Juventus and ultimately soaring to the top by the winter break. However, Milan turned it around with three consecutive 2-1 wins over Roma, two in the Coppa, to return to the peak by January end. Subsequent victories over Juventus and that most memorable derby meant Milan were steamrolling towards their 17th scudetto. The month of April however brought the skids on, first with that morale sapping loss at the Riazor and subsequent draws with Modena, Chievo and Udinese. Roma had made up the ground and were raring to have a go at Milan with sublime football emphasized by their talismanic captain, Francesco Totti, who had racked up 20 goals by the time that momentous showdown arrived in San Siro and had bagged a brace (another déjà vu moment) before the Milan match. Milan suffered yet another injury which ruled out Pancaro, who was having a great utility season and Alessandro Costacurta was nominated as left back and in charge of keeping Amantino Mancini quiet. Filippo Inzaghi was already out for the season and was preparing for his 2nd knee operation. Another forward was missing in action too, Vincenzo Montella who had undergone surgery himself, was not yet ready to return yet for Roma. With Milan drawing and Roma winning the match before their showdown, the equation was quite simple. Milan was 6 points ahead with 3 matches left to play. Roma needed a Milan meltdown to win their 2nd scudetto of the decade and Ancelotti’s previous history with Juventus was what gave them hope. Milan though could win the Scudetto with a victory over Roma. Such was at stake, that there was an effort to let Pierluigi Collina, the best referee in the world, officiate the match. However, since he had already officiated 6 Roma matches that season, and 6 was the limit that a referee could officiate for any particular team, Domenico Messina was appointed. The match itself got off to a flying start with a 2nd minute goal from Andrei Shevchenko courtesy a Kaka cutback. Jon Dahl Tomasson engaged Walter Samuel, ensuring Sheva had a free header and Pellizoli’s desperate dive would not be successful. There was controversy in the second half when a Totti freekick stuck Shevchenko’s elbow while he was taking evasive action in the wall. Shevchenko had recently recovered from a facial injury and was obviously apprehensive about getting hurt again. Another day and another referee might have given that as a penalty but this time it was not to be. Roma got their tails up and Dida had to stand strong on another Totti freekick. Round about this time, the Roma tifosi, took it upon themselves to take the fight to Milan. Flare upon flare rained on San Siro. Gattuso and Dida were hit and more than once the referee had to stop the match so that the ground could be cleared. All this was happening of course in front of the eyes of the prime minister and Milan owner, Silvio Berlusconi, and the then President of Lega Calcio, Milan’s vice president, Adriano Galliani. Roma who had been punished earlier for violence during the derby, and asked to play their home matches outside Olimpico, risked further punishments. 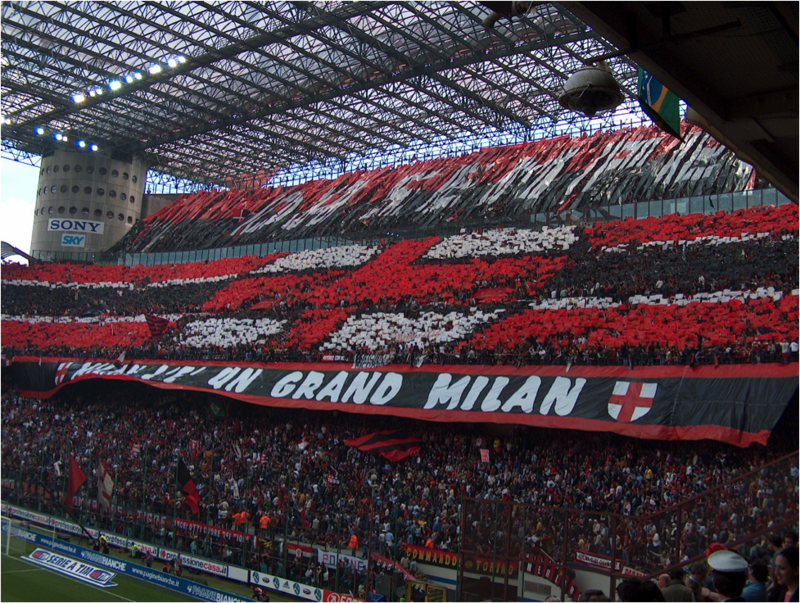 The match finished 1-0 and Milan were thus crowned champions of Italy. The team was packed with established powerhouses like Shevchenko (Top scorer of the league with 24 goals), Seedorf, Rui Costa, Nesta, Inzaghi, Gattuso with the experienced hands like Maldini and Costacurta still around and the rise of the new star on the horizon – Ricky Kaka. 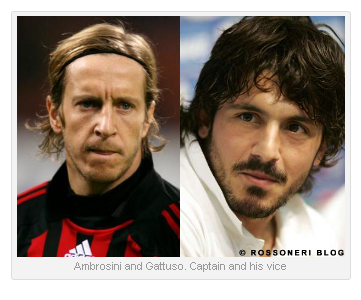 Ancelotti had certainly shown that he would lead Milan to another glorious period matching the late 80s and early 90s. In 2 years he had won everything that was coveted at Via Turati. As it turned out, for reasons beyond the scope of this piece, Ancelotti’s era at Milan was marked as a period of European spectacles for Milan, both of the right and wrong kind and a shameful negligence of the domestic front. It was as if Milan didn’t care who won the league, as long as they could finish within the Champions League spots and thus launch another bid for the glories of the continent. So far did Milan recede from the domestic front that Inter were allowed to roll up 4 Scudetti on the run (after they had been winless for almost 2 decades) and even cross Milan in the Scudetti count. 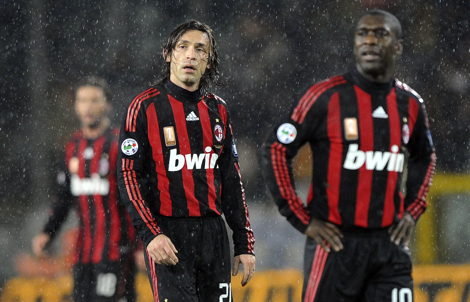 The players at the disposal for Milan during these years from 2003-2010, had been good enough to win two Champions Leagues, reach another final and be in the semi finals at least four times out of five between 2002-2007. The only time they missed the semis was when they lost at the Riazor, three weeks before that Roma match in 2004. However the best that Milan could do in Serie A was a couple of 3rd positions apart from the 2004 Scudetto. Surely a team with such talent at their disposal should have done better. Finally in 2011, the chance has come to catch the Nerazzurri and tie it at 18 Scudetti. Once more Milan have a big lead on the 2nd placed team, Inter this time around. This would mean the Scudetto is in the bag barring a major Milanese meltdown. Once more the match where Milan could hope to seal the league, based on their own performance as opposed to waiting for others to lose points, is against Roma. This time though the clash is at the Olimpico. (In one of those strange occurrences, 2 other celebrated rivals in Europe – Manchester United and Liverpool are also stuck at 18 league titles apiece and on the same day that Milan would meet Roma to claim their 18th, Carlo Ancelotti’s Chelsea will try to ensure Manchester United stay at 18). It is a match which Milan can afford to draw and still be crowned champions. However, this year Milan has a proud record to fight for. There is not a single team that can claim to have not been beaten by them in the Serie A except for Roma, who won at the San Siro; Udinese who drew 4-4 at San Siro and Lazio. However Roma and Udinese are the teams that Milan face in the coming weeks, and a victory over each is what would put the icing on the cake for the champions in waiting. 2004 was so many European memories back, that many Milanisti may not remember how it feels to be top dogs in Italy again. 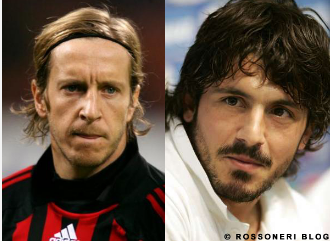 However, Milan have maintained a sense of continuity and come the 8th of May, there are as many as five players who would have played that match in San Siro in 2004 – Nesta, Seedorf, Pirlo, Gattuso, Ambrosini several of whom may be in the starting XI again. However there is a sixth member from that match who can prove to be the trump card. Antonio Cassano started that match in Capello’s 4-4-2 with Totti. He may start this match in a 4-3-1-2 with Ibrahimovic. 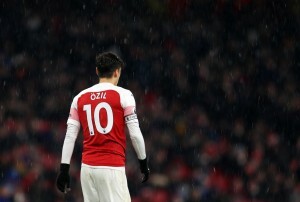 If he gets his chance, he would do better than last time, when Nesta and Maldini ensured, he would have a largely fruitless time and be substituted by Delvecchio midway through second half. Milan has been astute enough in the purchase of players, especially in the winter window and clearly players who can contribute to Serie A success had been brought in, even when they would not be available for European matches. The management has had a probable rethink on the philosophy of the last decade and would now give the domestic title its due importance. Knowing Milan’s history, one is sure that European glory would always be sought after, but hopefully not at the cost of disregarding the Scudetto. The first year of the decade is quite the right time to start a new dream-run and all that remains to be done is an encore of what another vintage Milan side did to a Francesco Totti led Roma side seven years ago. The 8th of May 2011, could just be the start of a new chapter for all Rossoneri around the world, one that would finally consign those faded memories to the history books and create a new breed of Scudetto heroes. But till then, and in seemingly never-ending anticipation, enjoy the spectacle of 2nd May 2004.